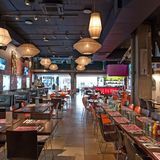 "Eat, drink and feel famous at Central London’s Must Experience Restaurant - Planet Hollywood. 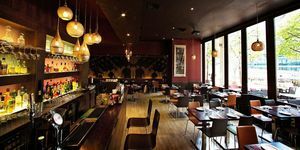 Its’ Haymarket location is especially ideal for pre or post theatre dining. Its’ irresistible menu includes burgers, sandwiches, pastas, pizzas, ribs, steaks, fish , fajitas, Asian and salads. There’s a resident DJ every evening, movie memorabilia and a merchandise shop." By sending this booking your details will only be sent to Planet Hollywood and will never be shared with other third parties. By clicking this box you agree to the Terms and Conditions set out above. 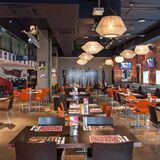 You can book to reserve an area of Planet Hollywood for you and your friends. Just enter your requirements below to see what they have to offer. What did you think of Planet Hollywood? There are so many interesting bits and pieces of memorablia and the cocktails were great too. I popped into Planet Hollywood for a couple of drinks and I absolutely loved it! There are so many interesting bits and pieces of memorablia and the cocktails were great too. I will definitely be coming back to try the food. always really friendly staff and the burgers are great! A really cool place to visit for a few drinks and food with friends and family. Just been to lunch at Planet Hollywood and had some really tasty beef sliders in the bar. With movie memorabilia everywhere and friendly staff this is always a fun place to visit! Best dinning experience for a long while amazingly refreshing! What a fantastic place to go for pre theatre the service is fast and the food is tasty and well presented served by your friendly waiter where nothing is too much trouble! Ribs and steaks were amazing they came within 12 minutes of ordering the sweet potatoe fries were the best I have tasted in London. I will defiantly be returning with my extended family as they seem to be set up for larger groups and family get togethers. I hear they have just been given an award for best family restaurant in London! A well done to Kenyan our waiter for looking after us. The staff here were excellent , however as for the food I wish I could say the same. I went to this resturant with a bunch of friends and our meals were terrible! My burger was full of greece , my chips were over cooked and were covered in brown marks and as for one of my friends ,his burger it was undercooked . The drinks were all flat, and warm(coke etc. )and the water provided was tap only. The dessert seemed to vary one friend and I have ice cream that was litterally 'ice' there was no way of eating it withoutlooking like a fool , whereas my other two friends said the dessert was fine. 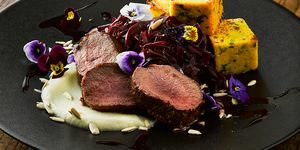 So overall i believe this is one of those places way too overrated and for a resturant located where it is i in London I was appalled with the food standard in fact I would have preferred McDonald's . We pride ourselves on our high levels of guest service and the quality of food we serve and we usually receive very good feedback regarding both of these, so we were very sorry to hear of your disappointment on the day of your visit. We have managers on duty, who would have been more than happy to come over to speak to you regarding your issues, if requested at the time. We will be willing to look into it and investigate more in case you have a receipt that you can email to us. I have dined and had drinks at Planet Hollywood numerous times and as a local to the area always tend to choose it over other restaurants/ bars for it's easy going & fun atmosphere, great music (the cheesy 80's and 90's tunes are a treat) and the food which is delicious - the best burgers and ribs in town for sure! And even after César salad you won't be leaving hungry! 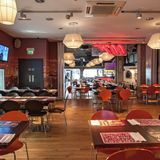 I would definitely recommend Planet as I have had s much fun with my family and friends and so those who are looking for a place with a buzz - this will be the perfect option! Besides - it still serves food until 1am, hard to beat! Had dinner at Planet Hollywood last night with a bunch of friends and we had a great time. The restaurant was really buzzing with Xmas and birthday parties but we still got flawless service, very attentive and smiley. And food was good too! Thanks Planet for a great night!!! Went to Planet Hollywood few nights ago for a friend's birthday bash and we had a great time. Our waitress was great fun and so attentive. We all loved the food and cocktails, it was all really tasty. And I loved the way we were filmed on the TV's, birthday boy was sooo embarrassed, but in a good way. I would definitely recommend Planet Hollywood if you are going out to celebrate, great place for it!! Went last weekend with a group of friends for a hen night. Had a great night. The food was really good, great service and excellent music. We really enjoy our visit. “excellent service”this was our first visit. We appreciated the 'no booking' system on a saturday as it meant we could make a last minute decision to go there. We were told there would not be a table for about an hour and were told to listen for our name to be called out, which meant we didn't have to stand in a queue. After 30 minutes we were seated at a table in the British room thankfully because the level of noise in the main floor of the restaurant was a bit too high for conversation. The waiters (thom in particular) were excellent, attentive, friendly, helpful and we weren't rushed even though there seems to be a permanent queue to get in. We had nachos and fajitas which were good, no room for pudding, although they sounded delicious. A memorable evening. I went yesterday and I have to say I am not sure what the complaint below is all about, i found it to be nothing more than what it says on the tin. quality food served by polite staff with a nice atmosphere. Yes we werent in there for that long but why would anyone choose Planet Hollywood to take a long boozy dinner - if I wanted that I would go to an appropriate restaurant. For me, growing up with this place as part of my life its all about the experience! Thursday 12th November. Partners birthday wanted a nice location somewhere child friendly so we could take the kids. STAFF was friendly, greeted us nicely atmosphere not what u'd expect for a west end location lay out all wrong really need to re-design the interiors the seating plan don't work they have a loads of screens which are place too high, you can display birthday messages nice but would be better if they could be heard and unless your bending your neck to look out for your message to be displayed your likely to miss it. SERVICE too fast. FOOD served at microwave speed. For such simple American style dishes don't know how it manage to taste so tasteless! could benefit from some new chefs. VALUE FOR MONEY well im so glad most of the cost was covered by my reward vouchers from tesco so for some reason i didn't feel as ripped off as i might of felt handing over cash. Given the occasion it was a huge let down of expectations so i didn't want to ruin the evening by spending time complaining. Only positive was the kids seem to enjoy the music and the milkshakes but then again i can think of several places that do better shakes. sorry planet Hollywood sorry i mean ph whoever re vamp the logo to ph has probably not done it any justice either. I think the new Planet Hollywood is far better than before! It is more sophisticated, the place does look clean, fresh and contemporary. The food, service and atmosphere are first class. I definitely recommend it for a great night out. Also the new bar here is far cooler and more fun than the last Planet Hollywood in the Trocadero. Superb! Went last weekend with a group of friends. Had a great night. The food was really good. The service was outstanding and the cocktail menu is top. We were celebrating a birthday and were made to feel really important. looking forward to going back in a couple of weeks for my birthday!! Are you a film buff? Do you love US food? 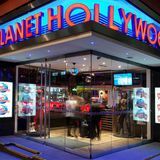 You can combine the two at Planet Hollywood, a salute to the silver screen in the heart of London. Planet Hollywood is vast, a huge barn of a place. And right from the moment you walk through the door — when you come face to face with a rather anorexic-looking Terminator — you step into the world of movies. Around the walls, and set into the windows, sits a raft of movie memorabilia, including Indiana Jones’ whip and chalice; the lamé suit from Goldmember (no one said it was going to be classy); John Travolta’s leather jacket from Grease, and Arnie’s head from Batman & Robin, when he played Mr Freeze. The Starship Enterprise, presumably scaled down, hangs from the ceiling. It’s worth walking round the entire restaurant, trying to match every item to the correct film. If you’re lucky, you’ll be seated in one of the booths round the outside, with your own personal piece of movie history next to you. Not surprisingly, the place is jumping. It’s school holidays so children abound, but that is probably par for the course, and there looks to be a fair number of tourists - again, par for the course. The music is loud, but not unbearably so, and the rather utilitarian tables and chairs in the middle of the restaurant are well filled. Staggeringly attractive wait staff whisk up and down the isles and the service is surprisingly (for the size of the place) efficient. Massive screens show music videos and clips of films and every so often they flash up messages from diners to their loved ones, texted from their table. A little kitsch, maybe, but there nothing wrong with that. This is Hollywood! Heaven knows what the table-turning target is, but no one seems hurried. And though you may surmise that the food is not the star attraction, it's not bad at all. The menu reads like a cast list for a summer blockbuster — it’s that long and detailed. There are 12 starters, including a mammoth platter, if you can’t make up your mind. The Texas tostados (£7.95) comprise four mini tortillas loaded with barbecue chicken, sautéed onions and two types of cheddar, served with sour cream and a tangy pico de gallo — a fresh tomato and onion salsa. The tostados feature on the platter (£18.95), along with buffalo wings, chicken crunch, parmesan spinach dip and potato skins. What it doesn’t include is the blackened shrimp, which is well worth trying. Six marinated jumbo shrimp (or prawns, if you prefer), are peeled (with tails left on for less messy eating), pan-fried in cajun spices and served with a creole mustard sauce for dipping. At £12.50, it’s an expensive starter, but you shouldn't feel short-changed. In fact, all the food at Planet Hollywood offers value for money, primarily thanks to the sheer generosity. There is quality there, too. A full rack of ribs is fairly hefty, and the sauce - lavishly applied - is tangy as advertised and the ribs themselves juicy and full of flavour. You’d expect this sort of place to do a terrific burger and so it proves. The barbecue bacon variety (£11.95) is topped with hickory smoked bacon, barbecue sauce and sharp cheddar, with lettuce, tomato, onion and pickle. Like the ribs, it comes with excellent skinny fries. There is the option to double up on the patty for £16.50, but only the very greedy should really consider such indulgence. Gloriously over-the-top desserts — this is an American chain, after all — include an excellent strawberry cheesecake (£6.50) and an alluringly named chocolate brownie super sundae, served in a giant Martini glass (£13.50). A rum baba (£6.75), as delightfully retro as it sounds, is sadly less successful. The baba itself is light and fluffy, but the syrup in which it is drenched tastes slightly chemically and woefully synthetic. It is whisked away without demur and replaced almost instantly with a white chocolate bread pudding (£6.50). This is neither as stodgy nor as sweet as it sounds and comes with a punchy bourbon sauce and whipped cream. What sort of movie would it be without a cocktail? Planet Hollywood has an extensive selective, including old favourites and some in house creations. One of these is Blue Crush (£7.50), a blend of vodka, Bacardi, Blue Curaçao, tequila and lemonade. It is a rather lurid blue — the bright azure of a Beverley Hills swimming pool, perhaps — but is deliciously refreshing. Amongst the old school options is a Long Island Iced Tea, with a kick like a mule. Still on the movie theme (it’s hard to avoid), there is something called The Terminator — vodka, gin, Bacardi, Cointreau, Kahlua, sours, cranberry juice and draught beer. It certainly sounds pretty terminal. If you can come back from that, among the wines are a decent Finca Valero Macebeo at an equally decent £15.95 - excellent value given the location and the venue, with a red Garnacha/Tempranillo equivalent at the same price. The wine list is fairly succinct — something of a relief given the choice elsewhere — and house champagne is Lanson, at a not unreasonable £49.95 for Black Label or rosé. Planet Hollywood isn’t the place to go if you want fine dining. It’s all about the experience — the buzz, the memorabilia, the vibe and the fun. And while the food may not be the top billing, it's not a bad supporting cast.